PestXpert Premium Bed Bug Killer will provide residual control on all stages of bed bugs for up to 4 weeks. It contains a special blend of active ingredients which is effective in killing adult bed bugs as well as bed bug nymphs and eggs through contact. In this video, we will show you the basics of how to use it! PestXpert Premium Bed Bug Killer will provide residual control on all stages of bed bugs for up to 4 weeks. It contains a special blend of active ingredients which is effective in killing adult bed bugs as well as bed bug nymphs and eggs through contact. It features a non-staining formula so it can be directly applied on or onto mattresses. PestXpert Premium Bed Bug Killer is a ready to use insecticide spray for indoor applications in both residential and commercial buildings. Apply as indoor crack and crevice or direct spray application. May be used for application with handheld or backpack sprayers. Product comes in 64 oz. and 1 gallon bottle. NOTE: Container does not come with a trigger sprayer. Must purchase separately. Consider our Chapin 1 Gallon Pump Sprayer (#20000). Hotels, shelters, modes of transportation, restaurants, schools, nursing homes, warehouses, offices, apartments, motels, kennels, and hospitals. Apply as indoor crack and crevice or direct spray application. May be used for application with handheld or backpack sprayers. Spray bed bugs and eggs directly wherever possible. Apply as a pin-stream, coarse spray or low pressure spray for crack and crevice, carpet perimeter, and direct spray applications in and around non-food areas where bed bugs and their eggs may hide. READ ENTIRE LABEL. SHAKE WELL BEFORE EACH USE. A READY TO USE INSECTICIDE SPRAY FOR INDOOR USE ONLY. For best results, vacuuming surfaces is recommended prior to treatment. Spray bed bugs and eggs directly wherever possible. Apply as a pinstream, coarse spray or low pressure spray for crack and crevice, carpet perimeter, and direct spray applications in and around non-food areas where bed bugs and their eggs may hide or harbor. For example, on and around baseboards, floorboards, mill-work, bed frames, headboards, wall hangings, furniture, door and window frames, walls, closets, window treatments, beneath floor coverings, as well as other non-washable items that may come in contact with bed bugs such as luggage, shoes and backpacks. If treating a pet’s living environment, spray on and around pet beds, bedding, floors, sleeping areas and furnishings. This product can also be applied with a paintbrush to walls, floorboards, behind wall hangings and other similar areas. 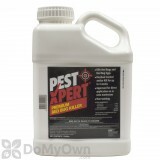 PestXpert Premium Bed Bug Killer can be directly applied to mattress and box springs surfaces. For porous surfaces such as mattresses and carpet perimeter areas, apply until thoroughly damp but not wet. Infested bed linens should not be treated. These should be removed, tightly sealed in a plastic bag, laundered and dried at high temperatures prior to re-use. Vacuuming surfaces prior to treatment is highly recommended. Using pinstream, coarse or low pressure equipment, spray directly to mattress surface paying special attention to seams, folds, tufts and edges as well as bed frames and box springs where bed bugs harbor. Re-make bed with clean linens prior to reuse. THIS PRODUCT IS NOT FOR USE ON HUMANS OR ANIMALS. Do not spray product directly on pets. Do not use in commercial food/feed processing, preparation, food/feed storage or serving areas. In the home, all food/feed processing surfaces and utensils should be covered during treatment, or thoroughly washed before use. Cover or remove exposed food/feed. Remove pets, birds and cover fish aquariums before spraying. This product will not stain water-safe fabrics and surfaces, however care should be taken to test an inconspicuous area for staining prior to use. DO NOT allow adults, children or pets to enter treated area until sprays are dry. DO NOT apply to plants or crops. DO NOT treat areas when occupants are present. DO NOT apply as a space spray. DO NOT wet articles to the point of runoff or drip. DO NOT use treated articles until spray has dried. Follow the direction on the label. Clean up, vacuum and even killed any large bugs. Sprayed bed an baseboards even around the floor. In 1 week had small ones back. Sprayed again will have to see what happens. Excellent product. After using this product I haven't seen any bed bugs around my furniture or bed. My it is clean. This product is super easy to use. You only have to shake and pour into a sprayer. No mixing. Second review on this product. It says to reapply every 4 weeks,but really need to do ever 3 weeks to keep up with them. It's about the best to use, have noticed fewer every time it applied. 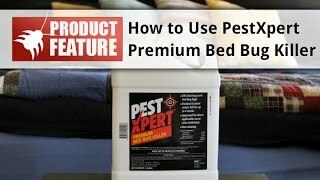 Will unused PestXpert Premium Bed Bug Killer still be usable if all not all used on the day of application? 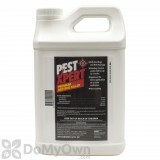 PestXpert Premium Bed Bug Killer is a ready-to-use product that does not need to be diluted with water. If you do not use the entire contents, it can be stored at room temperature for up to 3 years from the date of purchase. Is PestXpert Premium Bed Bug Killer safe for pets? PestXpert Premium Bed Bug Killer is safe around pets when used as directed. Pets and people should be out of the treatment areas during application and until dry. Are the active ingredients in the PestXpert Premium Bed Bug Killer equal to that of Crossfire? No, the active ingredient percentages in the PestXpert Premium Bed Bug Killer are not equal to that of Crossfire Bed Bug Concentrate. PestXpert Premium Bed Bug Killer is a ready to use product, it is not a concentrate, so there's no need to dilute with water. Is PestXpert Premium Bed Bug Killer a pyrethoid based product?